You may not be having an affair with a high-ranking American Intelligence Official, but that doesn’t mean that Big Brother isn’t watching you nonetheless. Or, at least, that might be the impression that you’re left with upon discovering that Google has reported a significant jump in the amount of government surveillance of online activity in recent months, especially when compared with just a few years ago. 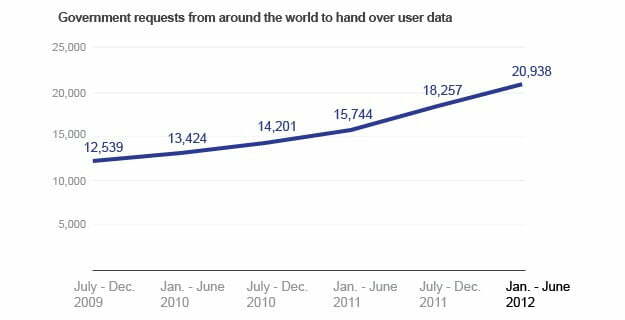 In its latest Transparency Report, which covers the first six months of 2012, government agencies around the world made a total of 20,938 requests for access to personal data of Google users, with 34,614 user accounts affected by the requests. Those numbers, notes the company’s Senior Policy Analyst Dorothy Chou in a blog post, are the highest yet for a six month period. “Government demands for user data have increased steadily since we first launched the Transparency Report,” Chou wrote, illustrating her point with a graph that showed the July-Dec 2009 period as having “only” 12,539 requests, jumping to 13,424 in the first half of 2010, then 14,201 for the later part of that year, then 15,744 and 18,257 for the two halves of 2011 before reaching the new high of 20,938 for the opening of 2012. The United States is by far the country whose government make the most requests, logging 7,969 for the six month period, looking into 16,281 accounts. India takes second place with 2,319 requests for 3,467 accounts, followed by Brazil (1566 requests for 2640 accounts), France (1546 requests for 1880 accounts) and Germany (1533 requests for 2007 accounts). In terms of the country with the most success rate for requests, America again comes out on top, with 90 percent of its requests being either partially or fully complied with, with Japan in second place (86 percent), followed by Denmark (78 percent) and a tie between Brazil and the Netherlands (Both at 76 percent). It’s not just requests for user data that are up for the period. Chou went on to explain that, while “the number of government requests to remove content from our services was largely flat from 2009 to 2011… it’s spiked in this reporting period.” Indeed, it jumped from 1048 requests in the final six months of 2011 to 1791 requests for the first half of 2012. The majority of material requested for removal remains related to defamation, with personal privacy or security and impersonation the next most likely reasons. The company made public some “notable observations” from the removal requests for the period, including the somewhat surprising news that requests from Turkey rose an amazing 1013 percent when compared with the previous six months (US requests also spiked, rising 46 percent from the second half of 2011).